Erin and I bought a boat. After taking sailing lessons in early August, I’ve been looking (without much serious intent) for a smaller boat that Erin and I would be able to practice and maintain our skills on as well as enjoying the great lakes. Early last week I found an ad on craigslist for a 1979 Laguna Windrose 22. The price was a little high but it couldn’t hurt looking into it. I emailed the guy with some questions and he sent me back more pictures and said that he was very willing to negotiate. After exchanging a few more emails, Erin and I went to check out the boat on Labor day. While typing out an email to the guy when we were ready to make an offer, he emailed me and preemptively lowered the price quite a bit. Most people, ourselves included, were somewhat perturbed by this. Why would someone state they were so willing to negotiate AND lower the price so much of their own accord. Well, when I went to get the boat Tuesday night with AtomicInternet, we went for a ride in it and everything seemed just fine. 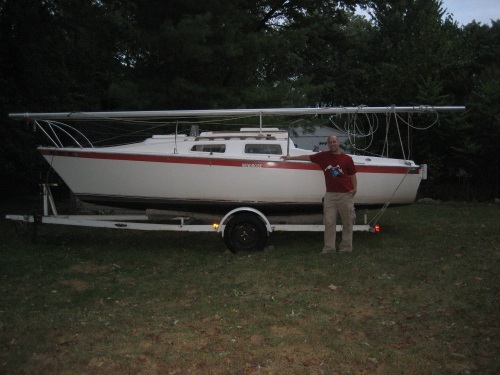 So after a couple hours of getting it on the trailer, mounting and tying down the mast, removing the engine and storing it in the truck bed, we took it back to the house. We’re hoping to take it out at least once before it get’s too cold and then possibly get a slip to put it in next spring. I’m hoping that this will keep us sated until we can afford a (much?) bigger boat that we’ll eventually be able to take on much longer voyages (than just around the great lakes). If you actually read this, you can probably look forward to an invite to go sailing sometime next year. Unless you’re Canadian.